Zechariah 8:23 (KJV): Thus saith the Lord of hosts; In those days it shall come to pass, that ten men shall take hold out of all languages of the nations, even shall take hold of the skirt of him that is a Jew, saying, We will go with you: for we have heard that God is with you. We live in a generation where some Christians aspiring to be on top of these mountains have been consumed by the spirit of compromise. Some Christians no longer pray because they got big time jobs that became a priority over God. How about Christian artists? When they were upcoming, they went to every church because their CD had to sell. When these got famous, church lost priority! I know a minister who was invited to preach to a group of students. When he arrived, he asked his assistant to go check how many people were waiting for him. When he was told that they were about twenty, he drove away! Such a one is waiting for a big crusade in order to make an impact, how?! How?! How about the minister who has thirty members and then wants six body guards? What message are we giving the church? What kind of influence will we have when God gets such on top of the mountain? Look at the Christian radio station that believes that they have to play secular music to attract adverts. The upcoming young Christian artist will think that you have to play secular music to be a success. That is not so! Jesus did not need to get drunk to win drunkards. Like our theme scripture says, nations will admire and cling to you because you have God. It is time God brought back the fear of the church to this world, like it was in the book of Acts! ( Acts 5:11). 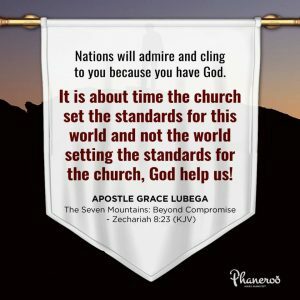 It is about time the church set the standards for this world and not the world setting the standards for the church, God help us! Nations will admire and cling to you because you have God. It is about time the church set the standards for this world and not the world setting the standards for the church, God help us! PRAYER: God I thank you for the great privilege of being a child of God. You have called me, separated me and sanctified me. I am a member of your body; your mind is my mind and I am the bone of your bones. I live my life with the understanding that I am unique, peculiar and special. With this knowledge, I am a trend setter to the world. To the glory of your name. Amen.